The journey through the desert is an extraordinary road trip in the winter, with daytime temperatures in the seventies, less traffic than in the summertime, and wide-open roads. As our first day wound down, we gazed to the east at a ridge of large spiny rock formations that appeared to have been magically splattered with massive amounts of rust, white and brown colored paints. It blazed gloriously as the sun set on the desert floor to the west. I noticed a shortage of traffic lights or obeyed speed limit signs, but the constant supply of potholes and the well placed, yet supersized speed bumps, somehow effectively regulate traffic on Mexico’s highways. TIP – I would not recommend traveling at night in Mexico, as these bad road conditions can exist in thirty-mile stretches with no warning signs. After overnight stops in the cities, Chihuahua, and Durango, we approached the eastern slope of the famous Sierra Madre Mountains. We entered the federal highway, 40D, a tollway inaugurated in 2012, connecting Durango to Mazatlán. The cliffhanging highway boasts 63 tunnels and thousand-foot vistas with waterfalls emanating from their pine-forested origin, gushing through jungles and rainforests in the clouds. We climbed over 9,000 feet to the summit of the twisting and turning road to a must stop-and-see photo opportunity at the small village at Mirador. Our reward was a stunning view of the Baluarte Bicentennial Bridge. The highest cable-stayed bridge in North America at more than 1,280 ft. The breathtaking views continued as we made our way over this man-made colossal. It didn’t cease as we wound through the tunnels and smaller bridges clinging to the side of the cliffs. We made our way to the coast and were ready for seafood and cerveza. Cliffhanging excitement builds a powerful hunger. After the first leg of our journey, we landed at our first planned destination, the Funky Monkey Hostel in the popular Golden Triangle area of north Mazatlán. Upon our arrival, the internationally mixed group of friends warmly greeted us as if we had known one another for years. Luckily, we arrived, just-in-time for the ten-minute walk to our first glowing sunset on the beach. Our host, Salem, is an expat who migrated from Michigan and pioneered the idea of the Funky Monkey Hostel. In 2013 he opened the first hostel in Mazatlán. The Funky Monkey is an excellent place to meet new friends and enjoy the beach atmosphere. Salem promotes a family-like setting, as guests are encouraged to participate in meal preparation to heighten the hostel-experience. 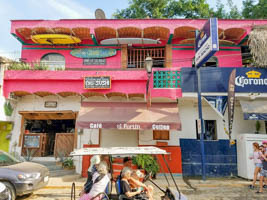 Funkey Monkey Hostel/Mazatlan—USD 24, per night, per dorm bed. Our journey’s next venture was an eight-hour drive south through jungles and mango orchard villages, to the beach town of Sayulita Nayarit, thirty minutes north from Puerto Vallarta. While in Sayulita, I discovered a new type of accommodations when I met Corey, also an expat, and hailing from Arkansas. Corey has created Chillums Surf House, the first-of-its-kind, mini-resort where guests can stay and learn to surf the best waves in Mexico. Corey personally leads surfing instruction tours. Corey’s serious intention for guests to learn how to surf is balanced by the laid-back surfer’s atmosphere. With the best sushi in town and a house labeled tequila at the intimate onsite bar, this mini-resort is truly authentic. Chillums Surf House/Sayulita. Private rooms – USD 37 per night. 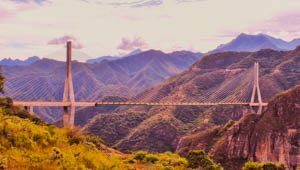 This winter’s Mexico trip had many fantastic moments along the road and was uniquely inspiring because two expat Americans have found success at offering great experiences for unmatchable bang-for-the-buck prices while living the life they love and setting trends in the travel industry.